Yesterday afternoon our local Rural Fire Department responded to a wildland fire. A whole bunch of fire departments just outside of L.A. responded to fires too. By dark, we had ours contained, while in southern California, homes were burning. We had a gentle breeze; they had Santa Anna winds with gusts up to 65 mph. What a difference the wind makes! It was a great feeling last night, returning to the hall knowing that we had responded quickly, worked hard, cooperated well with other responding departments, and brought the fire under control with no loss of life or structures. There was also a feeling of gratefulness that the wind was not an issue in this case. 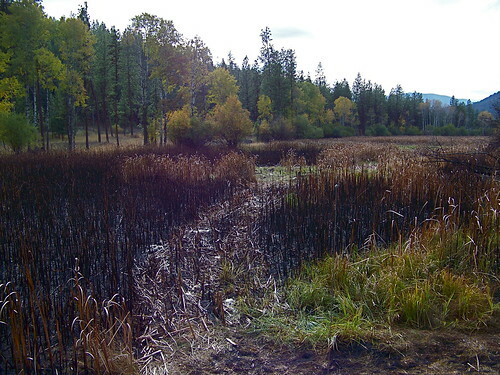 This fire began in a cattail swamp near the top of a small mountain a dozen miles from town. There were about a dozen homes in the immediate area. 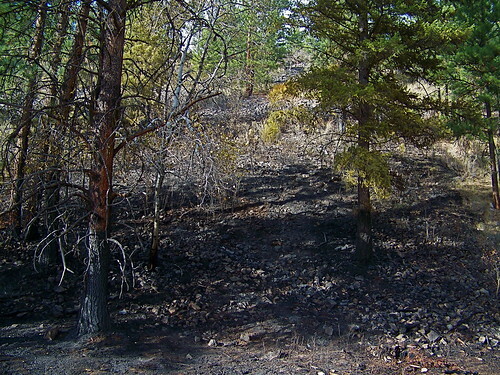 In the first photo, one home can be seen in the background, not far from the scene of the fire. I’m sure that was one anxious family! You will have to take my word for it, the hill behind this scene was a lot steeper than the lens thinks it is! 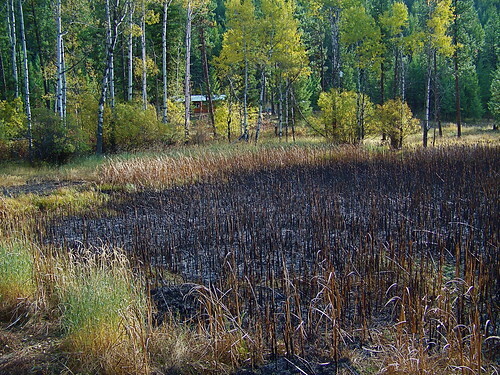 We were able to stop the advance of the fire before it entered the forest at this spot. 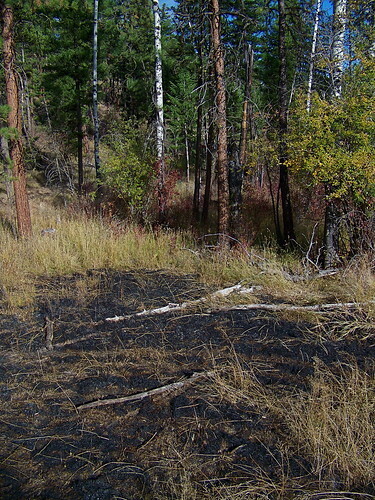 The tracks of a brush truck going right through the fire to secure the far end. 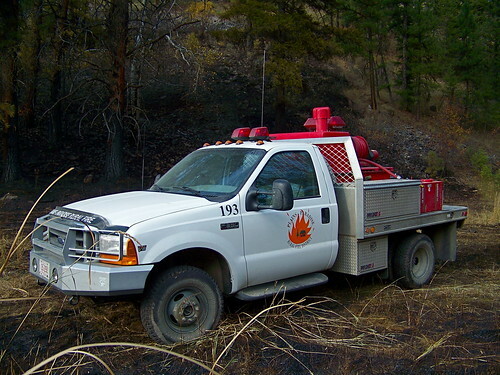 One of the keys to rapid response and success in fighting wildland fires has been the invention and production of “brush trucks”. They enable departments to attack new fires very quickly and efficiently. They are very maneuverable and have lots of capabilities. The next photos are of the one I usually have the privilege to drive. It has been in many places where trucks just aren’t supposed to go and I’m getting very fond of it! The basic truck is a reinforced 4 wheel drive 1 ton pickup (this one has the big 7.4 liter Power Stroke diesel engine). The tall red tank with the “stack” on top is a 300 gallon water tank. To the right of it is a reel containing 150 feet of pressure hose. 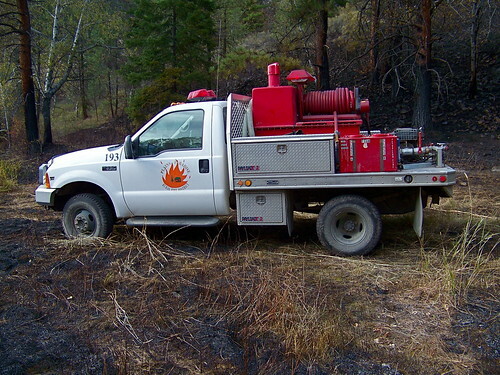 After the truck is brought to a stop and shifted into “park”, in about a minute this hose can be putting a solid stream of water (or foam) on a fire. 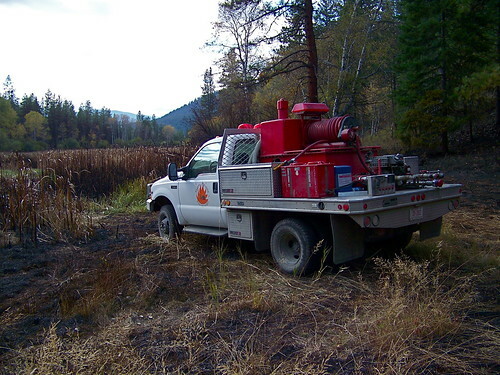 At the very rear of the truck is the key to the whole operation, a versatile pump system that can draw from the on-board water tank, a pond set up on the scene, a river or creek, or another truck with a water supply. It can supply a water source to hundreds of yards of hoses and multiple nozzles. Once again, last night our brush trucks proved their worth… and in this case the wind was in our favor! In a rural area something that is missing is infrastructure, some would say by definition. Others might say that the infrastructure isn’t exactly missing, but those who live there often are the infrastructure. 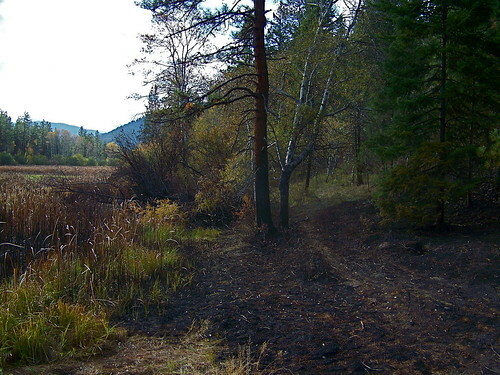 I was reminded of that yesterday when a call came over my pager inviting those of us who belong to the Rural Fire Department to go to the scene of a brush fire that was trying to get up into the timber. A house was near but not immediately threatened. In an urban area a fire call is answered by a professional team of firefighters: in a rural area it is answered by those of us who volunteer. Despite the cold temperatures of a lingering winter and the fact that this area received far more than normal snowfall during the winter, the lower valley areas are already very dry and I’m afraid (I sure hope I’m wrong!) that the fire season started yesterday. Eight miles from town as we approached mile marker 67, the dispatcher’s location for the fire, we could see a column of smoke coming from a shelf area a few hundred feet above the highway and off to the right a half mile or so. The voice of our chief who was in the lead truck came over the radio informing us where to turn off to get into that area. Thanks to some good thinking and planning by the senior staff in our department, we have in our arsenal three wildland fire engines (brush trucks) which are light trucks which carry 300 gallons of water, a pump system which injects foam, creating a water-foam mix that is incredibly efficient and room for extra hose and all our other gear. The 4X4 F350 that I drove today had all it could do with all six wheels spinning to climb a steep trail up the mountainside to get into the right position for delivering our foam to the head of the fire. After three and a half hours with crews working from our brush trucks, a crew from the state DNRC and a crew from the USFS the fire was out and being mopped up. We used over 1500 gallons of water and foam, filling each truck twice from our 3000 gallon water tender also near the scene, got filthy and smelly and had a wonderful time. Sometimes it’s fun to be a part of the infrastructure! As far as I was concerned, the best reward came just as we were wrapping everything up when about 20 Bighorn sheep strolled out into a small clearing a hundred yards away and stood looking at us as if to say “thanks for protecting our home”. How sweet it is when you win! At 5:30 this afternoon, right smack in the middle of the very best Reuben sandwich I’ve ever eaten, my Rural Fire Department pager went off and I had to scramble to the scene of a chimney fire. As opposed to the fire of last Monday, this one was reported early and was close to our fire hall. Although the smoke could be seen from two miles away, we were able to get there quickly, extinguish the fire and save the home. The owners were happy to deal with the damage we had to cause to get it all out. For those not familiar with chimney fires, they can sometimes burn hot enough to ignite the roof and surrounding flue materials, as was the case today. Had we not gotten there in time, that house would have been completely destroyed. Take it from me, it’s a terrific feeling to get there in time to control the situation and then leave knowing that we saved a home! And that Reuben, after being warmed up a little, tasted even better at 7:00! At a quarter to midnight Monday when the first shrill alarm tones from my pager shattered the stillness of the night, I rolled out of bed and began pulling on my jeans. 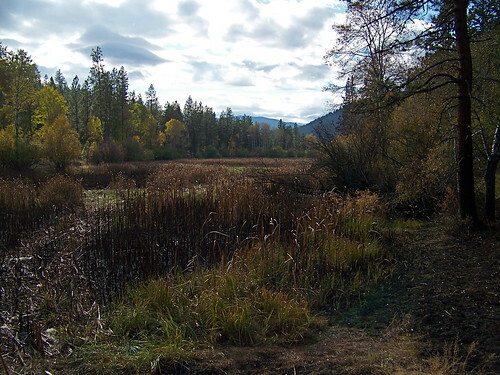 By the time I was reaching for my boots, the voice of 911 dispatch was requesting Rural Fire and area ambulance to respond to an explosion and fire in a residence some sixteen miles down river. It was thought that there were people still in the building, power lines were down and arcing, and a large LPG tank was in the flames. On the way to the fire hall a quick glance at the Jeep’s speedometer showed 85mph, much too fast for the number of deer usually around the highway at night, but a necessary risk under the circumstances. Four minutes later when I arrived at the hall, the chief was already starting to roll in the lead truck. His quick instructions were to take E91, a pumper engine made for structure fires that carries 750 gallons of water, hundreds of yards of hose, and a crew of four who were already there and getting into their “turn-out” gear. Someone had already started my truck’s engine, the emergency lights and siren were on, the big door in front of it was open and I quickly got into my fire gear, swung up onto the seat, released the air brake and found first gear. We began to roll. Twelve miles later the big truck topped a hill and as I spun the wheel to make a sharp left turn and began shifting up through the gears again, out of the black of the night the fire could be plainly seen four miles in the distance: it was obvious immediately that there would be nothing we could do to save the home. My four crew members knew it as well and fell silent, just looking and waiting for us to cover the remaining miles. When we arrived at the scene, the chief’s truck was in position to the east of the blaze and I brought my engine to a stop above and across from the front of what had been a big log home, now a mass of flame. Then, by some careful maneuvering following a guide, I was able to turn the truck around and descend a fairly steep slope, putting the business side of my engine right next to the fire. Within minutes we had a 2 inch hose shooting water on the flames and cooling the LPG tank, but the home was far beyond saving. By the time my water tank was empty the water tender had arrived and we tied it into my pump system and poured another 3,000 gallons on the flames, keeping the LPG tank from exploding and keeping the fire from spreading any farther. We put 16 tons of water on a structure we were just too late to save. By 3 AM we had done all we could and retired from the scene. It was a relief to find that the concern about residents still in the structure was unfounded. It had been occupied that night by only one elderly man. His dog woke him in time for him to escape unharmed: sadly however, the dog did not survive. Episodes like this one, while very bitter to the palate at the time, do however bring a focus to bear on several things about living in a rural community, two of which are especially significant to me. Number one, of course, is that in the middle of that night over twenty people responded to the scene, all of whom, with the exception of one law enforcement officer were volunteers, and all of whom performed their duties with hard work and diligence and without a single word of complaint. I’m glad to know those men and women and I’m glad they live here! And the second thing… There are lots of negative stories in the media about today’s young folks, but on Monday night over half of those volunteers who responded were under the age of 18. We have a fantastic crew of young men and young women who are mature, dedicated, trustworthy, and a pleasure to work around. Their enthusiasm is contagious, and their quiet courage is commendable. I think of them when I need a good shot of optimism in a world that at times seems to be spinning out of control.